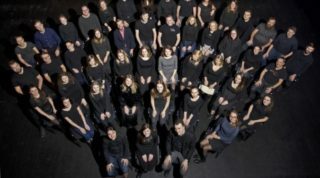 The Latvian Radio Choir has long been the premiere interpreter of Latvian composer Pēteris Vasks’ choir music. Their many recordings of Vasks’ songs, both secular (2012’s Plainscapes, 2000’s Māte saule) and sacred (2007’s Pater Noster) have been landmark recordings, not only cementing Vasks’ reputation as one of the premiere living choir music composers, but also the Latvian Radio Choir’s reputation as one of the leading choir music interpreters worldwide. 2017’s Laudate Dominum can now be added to this already venerable discography. The recording is a collection of five sacred works for choir and orchestra, all composed between 2011 and 2016. Joining the Latvian Radio Choir and conductor Sigvards Kļava on the album is the equally talented chamber orchestra Sinfonietta Rīga. 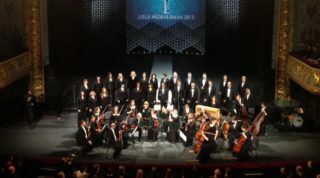 Sinfonietta Rīga also has a long history with Vasks and his music, and have also recorded many noteworthy CDs of Vasks’ orchestral works, such as 2012’s Vox Amoris and 2008’s Viatore. This album is also not their first recording of Vasks’ music with the Latvian Radio Choir, as they also played on the Pater Noster recording. Much of Vasks’ music, both choral and orchestral, focuses on spiritual and sacred themes, and many of them can be considered prayers, such as ‘Da pacem, Domine’. According to Vasks, this quiet and restrained work was composed to be a ‘cry of desperation for our times’, and the Latvian Radio Choir provide an engrossing and compelling performance of this piece, which is at once both tinged with sadness as well as hope. ‘Mein Herr und mein Gott’ is based on the writings of 15th century mystic Nicholas of Flüe (also known as Brother Klaus), who, in his later years, had a crisis in spirit and lived as a hermit for twenty years. The prayer, an exhortation to God to bring one closer and remove everything that distances, is deeply personal, and Vasks provides an appropriate musical vision of this prayer, full of piety and veneration. The choir and orchestra are joined by organist Ilze Reine on ‘Laudate Dominum’, a fifteen minute work where the only sung text are the phrases ‘Laudate Dominum’ and ‘Alleluia’. Alternating between the rich and solemn organ performance and the reverent choir singing, the work slowly builds to a climax before reaching the triumphant, jubilant conclusion with the repeated word ‘Alleluia’. The record also has two works inspired by the writings of Mother Theresa. The first is simply entitled ‘Prayer’ (subtitled ‘Lord, open our eyes’). Vasks’ works can often be discordant and harsh, and while the music on this collection shies away from that kind of approach, there are elements of this aspect of Vasks’ compositional style in ‘Prayer’. That is quite appropriate, considering that this prayer is to ‘hear the cries of the hungry, the cold, the frightened, the oppressed’, and Vasks often clearly and directly articulates suffering and hardship in his music. The second work inspired by Mother Theresa is ‘The Fruit of Silence’, a work the Latvian Radio Choir has recorded previously (2015’s The Fruit of Silence), that time with choir and piano. This time, the piano (which only played single notes throughout the piece) has been replaced with the orchestra, which adds an additional dimension to the work, particularly at the conclusion of the work, with its placid and harmonious resolution – quite appropriate, considering that the final word in the work is ‘peace’. Pēteris Vasks’ music is at once personal and universal, and the collaboration between the composer and the Latvian Radio Choir and Sinfonietta Rīga has resulted in the beautifully spiritual Laudate Dominum. This collection of prayers reveals not just the talents of the artists, but also the keen and deep understanding and appreciation of the goals and musical visions of Vasks’ works. Vasks’ music, particularly his sacred music, is often serene and peaceful, with moments both of sorrow and brightness, and the choir and the orchestra, working in tandem under the masterful direction of conductor Sigvards Kļava, have created an excellent document of these works. For further information, please visit the Latvian Radio Choir website and the Sinfonietta Rīga website. This is a splendid recording. Peteris Vasks is one of the best living composers, and the Radio Choir is also among the best. I try to get anything they record. I will even duplicate music by Vasks if there is something I haven’t heard.